Our training and mentorship programs are designed to give you the information and resources you need to expand your involvement and help homeless pets. 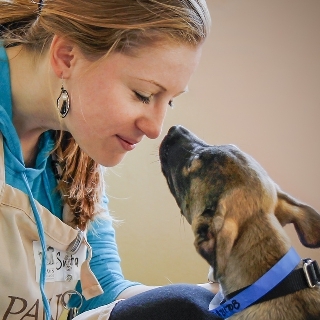 During this 30-minute orientation, you will learn about the founding of PAWS Chicago, how we are working toward our mission of building a No Kill community and the many ways you can get involved to help homeless pets. The PAWS for Life Outreach Program is a data driven program that helps to reach people in underserved areas of Chicago through door-to-door outreach and work at Animal Care & Control’s Front Desk. In this 30-minute orientation, you will learn about the needs of pets in poverty, challenge common assumptions surrounding pet owners with low incomes, and learn about the importance of door-to-door outreach and our work at the city pound. You will also learn basic tips on how to appropriately approach people, learn about our follow up process and learn about the ways you can help in the PAWS for Life Program. Come learn about our Humane Education Program’s robust offering of presentations and learning sessions in Humane Education Orientation, where you will hear about the programs, the message and the methodology. 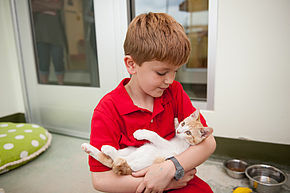 From our modular curriculum for middle-school children and high school teens to standard presentations that can be delivered to a variety of audiences to our PACT (PAWS-Animals-Community-Teens) After School program, we need volunteers to help facilitate and reach the next generation of animal lovers. You’ll need to attend this training in each of the Adoption Center locations where you plan to volunteer. During this training, you will walk through a day in the life of a Dog Town Level 1 Volunteer to understand the various responsibilities and receive an overview of how Dog Town operates. From understanding the specific Adoption Center layout, signage on the dog suites, our walking paths and important safety guidelines to understanding canine communication and body language, this comprehensive training will ensure you are ready for action in Dog Town. Dog Town Level 1 Training is offered immediately following each New Volunteer Orientation and runs for 1 hour and 30 minutes. Upon completion of this training, you will be able to sign up for sessions to work with our new volunteer mentors until you are comfortable with all aspects of being a Level 1 Volunteer. If you didn’t attend training right after orientation, simply show up at another training. Once you are a volunteer, there is no need to sign up. This training is typically held twice a month and runs for approximately 45 minutes. Upon completion of this course, you will be able to sign up for sessions to work with an experienced volunteer or staff member until you are comfortable with your role as a Level 1 Volunteer. 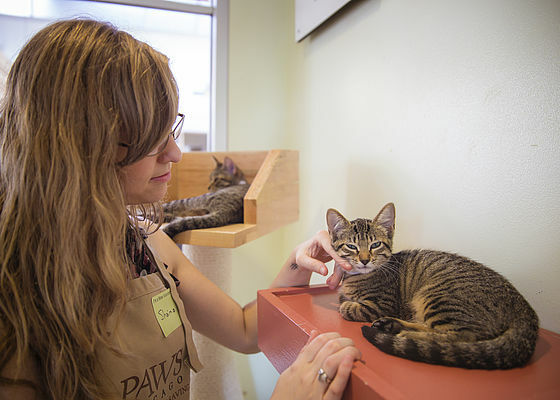 During this training, you will walk through a day in the life of a Kitty City Level 1 Volunteer to understand the various responsibilities and receive an overview of how Kitty City operates. From understanding the specific adoption center layout, signage on the cat suites and important safety guidelines to understanding feline communication and body language, this comprehensive training will ensure you are ready for action in Lincoln Park’s Kitty City. Kitty City Level 1 Training is offered immediately following each New Volunteer Orientation and runs for 1 hour and 30 minutes. Upon completion of this training, you will be able to sign up for sessions to work with our new volunteer mentors until you are comfortable with all aspects of being a Level 1 Volunteer. If you didn’t attend training right after orientation, simply show up at another training. Once you are a volunteer, there is no need to sign up. In this training session, you will get oriented with the unique environment at our Medical Center. All of our animals begin their journey with PAWS Chicago at our Medical Center. Some animals may be recovering from minor illnesses or are temporarily housed here until a foster home becomes available. During this training, you will learn the basics of animal handling and socialization in this unique environment. In addition, you will receive training on all the responsibilities of a Level 1 Volunteer at the Medical Center. This training is held twice a month and runs for 1 hour and 30 minutes. Upon completion, you will be able to sign up for volunteer shifts where you will be paired with an experienced volunteer or staff member until you are comfortable with all the responsibilities of a Level 1 Volunteer. When you begin your Adoption Counselor training, you will receive a package that reviews the fundamentals of PAWS Chicago customer service standards and our overall adoption process. Once you complete the pre-study, you will join an interactive workshop that reviews the process in practical application with activities that mirror real life adoption counseling. After the workshop, you will have an opportunity to work with existing Adoption Counselors and shadow during three sessions, or as many as you like until you are comfortable with the process and the responsibilities of an Adoption Counselor. Once you have attended Humane Education Orientation, you can sign up for our subsequent Humane Education Training classes to learn how to deliver our lesson plans to various audiences. Since our Humane Education Program is broken down into modules, our Humane Educators will be able to customize their presentation to any school-aged audience. The modules include presentations on Overpopulation, PAWS Chicago History, The Importance of Spay Neuter, The Human and Animal Bond and much more. Each training session will teach a different combination of modules so that volunteers can take their time learning the curriculum and be able to deliver it to various audiences. Visit our Junior Volunteers and Family Service Opportunities.